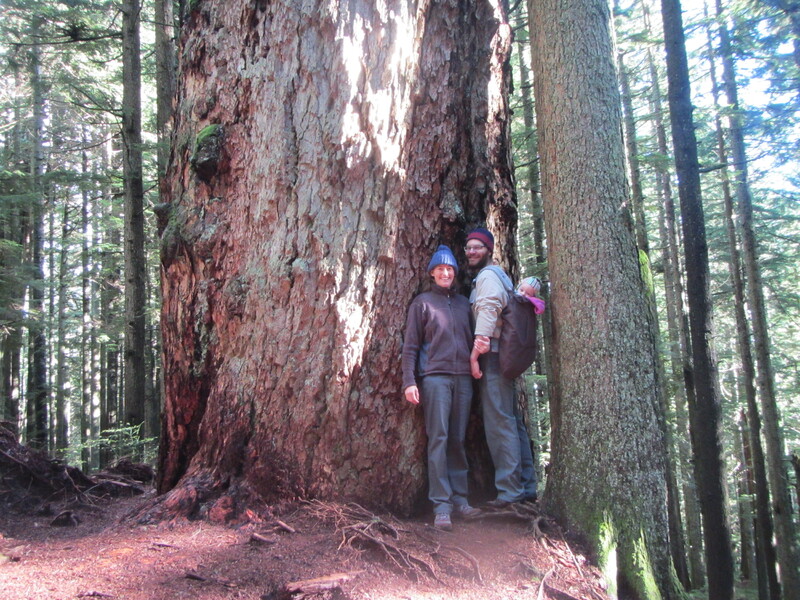 We recently hiked the Lawson Creek Forestry Heritage Walk in West Vancouver with our toddler on board. We all had fun so the hike was a success but we did start at the wrong time of day. Starting a hike mid-morning used to work well but now that our toddler is on one (afternoon) nap a day we’re going to have to adjust our start time. The rhythmic motion of walking was too hard resist and she fell asleep almost right away, then woke up after her normal lunch time, and never did sleep again that day which meant her longest stretch yet of being awake. Which is not a good record to set. It seems that just when you’re getting used to a routine with a little one the routine changes. Next time we’ll eat lunch at the trail head then start out. The hike itself was very interesting. It starts just below a cedar log dam built about 100 years ago for the logging operations of the time. The trail continues with numbered signposts along the way to mark other points of interest. Be sure to take a copy of the map with you so you know what the numbers mean (Lawson Creek Forestry Heritage Walk map). The highlight for us was this massive Douglas Fir that measured 3 m in diameter!